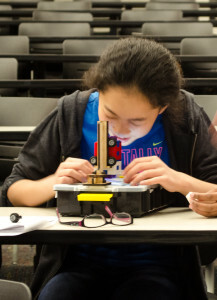 The BioIgnite Design Summer Camp teaches about exciting BioSTEM topics such as Biomedical Imaging, NeuroEngineering, Biomechanics, and Regenerative Medicine. An afternoon design studio teaches students all about the engineering design process and takes them through designing their own prosthetic prototype. Parents are invited to an open house on Friday where students show-off their prototypes and favorite activities from the week. Learn more about BioIgnite and our camps here. Visit here to donate or apply to our scholarship fund which helps deserving students afford the invaluable experience of attending a BioIgnite camp.